The Raiders were linked to Ndamukong Suh, he was supposedly going to make a visit to Oakland next week. It seems as if he is off the market. Contract details are starting to leak, making it appear more and more like the Miami Dolphins will sign free agent defensive tackle as soon as free agency opens Tuesday afternoon. Miami was not the only team chasing Suh, however, and now those other teams are starting to turn their attention to their other targets. Sun’s deal with the Dolphins is said to be a six year deal worth $114 million with $60 million gauranteed. The Oakland Raiders and Terrance Knighton have been linked since Jack Del Rio signed on as head coach. Kingston had tweeted out to AP’s @arniestapleton : “I want to be wherever Jack is. I’ll just leave it at that.” #Raiders .The Raiders are heavily invested in Denver’s Terrance Knighton, per a league source. Knighton had followed Del Rio from Jacksonville to Denver, and has played five seasons under Jack. 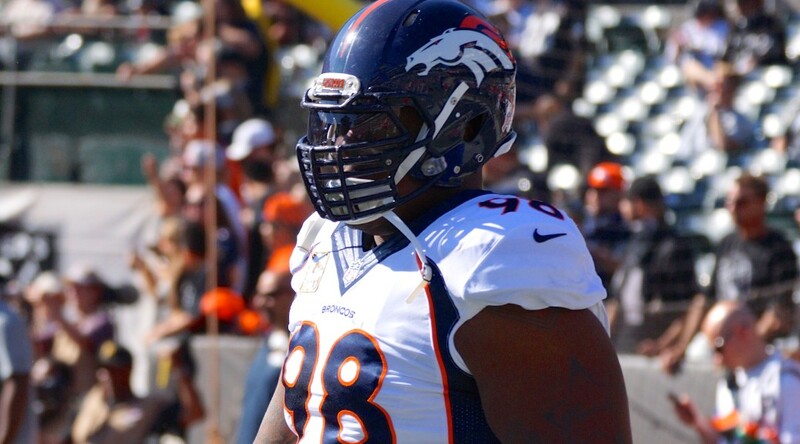 Knighton has said Del Rio would be someone he would speak to if a deal can’t get worked out in Denver. Del Rio spoke highly of Knighton last month at the NFL Scouting Combine. “We drafted him, and we thought at that time he was kind of a dancing bear type,” Del Rio said at the time. “Kind of a big powerful man that can stay on his feet and run down the line. This game is about big, powerful men, so that the guys that have the skill level can do their things. So, this big, powerful man played well in Jacksonville. We got back together, he played well in Denver and so I appreciate that. I respect that. Another option or even a bonus next to Knighton, if he lands in Oakland, would be the young Jared Odrick from the Miami Dolphins. The Dolphins have stated they would like to bring Odrick back to the team, but the Suh move seems to signal that they will not make a full effort to re-sign Odrick as he enters his sixth-season in the NFL. Odrick, Miami’s first-round Draft choice in 2010, has recorded 16.5 sacks, one interception, three forced fumbles, one fumble recovery, and 129 tackles in his career. Miami could still find a way to make the roster space to re-sign Odrick, looking to keep the 2010 28th pick next to the 2010 second overall pick once Suh officially joins the team. Odrick, however, is likely going to command a contract worth at least $7 million, a number, now that Suh is off the market, that could quickly exceed the Dolphins’ ability to pay if other teams start a bidding war.